Children may not be as interested in wearing sunglasses for fashion purposes, but they are in need of protection against direct sunlight as adults. Kids spend a great deal of time outdoors, and as a consequence, they are exposed to solar ultraviolet (UV) rays on a regular basis. We offer a wide variety of styles and sizes of children’s sunglasses, allowing you to choose the right pair for your child. 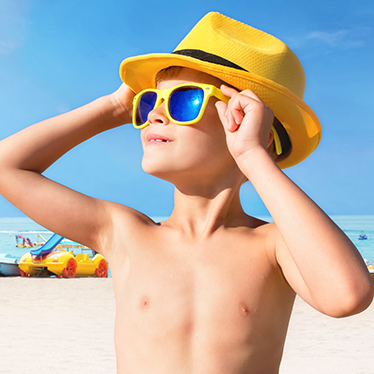 We have both prescription and non-prescription sunglasses for kids, all of which offer 100% UV protection. If you currently wear eyeglasses, you should consider purchasing a pair of prescription sunglasses as added protection for your eyes. Prescription sunglasses are the best solution out there if you want clear vision during outdoor activities or when driving on a sunny day. Not only do they eliminate glare, but they can prevent eye strain and vision problems down the road. We have a wide selection of prescription sunglasses available at all of our First Eye Care locations, including styles for men, women, and children. From high index plastic and progressive lenses to lightweight frames made from durable polycarbonate or Trivex, we’ve got it all. If you enjoy spending a lot of time outdoors and wear glasses or contacts, it is important you have sunglasses that will protect your eyes without hindering your activities. Performance and sport sunglasses are designed to be light, comfortable, and withstand the elements of the outdoors. The performance sunglasses offered by First Eye Care come in a wide range of tints in order to modify light, allowing you to see a baseball or tennis ball, for example. The majority of these lenses are polycarbonate, which is the “lens of choice” for sporting activities because they are lightweight, durable, and impact-resistant. We also offer a wide range of non-prescription sunglasses at our First Eye Care locations. We carry many different choices in style, designer names, and frame materials, allowing you to select the best option for your needs. 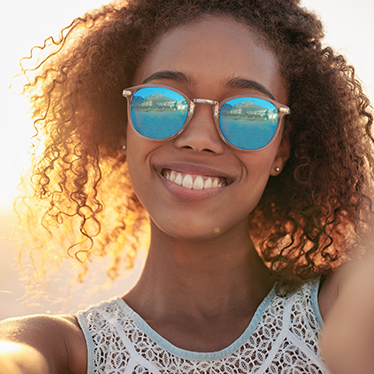 While the majority of people wear sunglasses to cut down the sun’s glare, they are a key element in protecting the eyes and your overall health. There are numerous reasons why you should wear sunglasses more often than you probably do, especially when spending a lot of time outside in the summer. If you have questions about the importance of sunglasses or would like to learn more about what is offered at First Eye Care, please visit the location nearest to you. We are dedicated to helping you find the right products, solutions, and services for your eyes. Please do not hesitate to give us a call and schedule an appointment or inquire about our sunglasses selection.